Terry Pratchett, Interesting Times. Ebook from the library, so I don't know how many pages. Yet another venture to the Discworld. 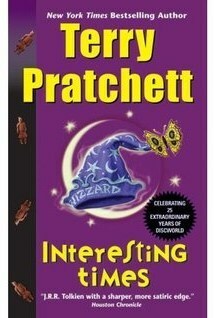 Summary: Rincewind, the (disc)world's most hopeless wizard (he can't even spell it, for heaven's sake!) finds himself on call in a land far, far away (any resemblances to China are, I am sure, totally coincidental). As for the rest, the title tells it all. You know the old curse, right? "May you live in interesting times." Probably the thing Rincewind wants least. He likes boring. Boring he never seems to get. Review: Pratchett skates close to the edges of real political incorrectness in this one, but it's funny enough that I don't think it matters. And however stereotypical the language problems he presents, they are not only funny but pretty accurate, at far as I understand Chinese (which admittedly is all by hearsay, as I don't in fact understand Chinese at all). Good jokes, good adventure, and about what I expect of Pratchett's writing. I'm trying to think of the flaws, as I'm sure there must be some. I know I was bothered by a lack of stopping places, but I don't think that's really a flaw. At most, it struck me that Pratchett was working a little too hard at this one, pulling up everything from the oddities of a tonal language to the terra cotta warriors and a bit that didn't quite fit the theme, about butterflies that change the weather. Worked for me, though. Definitely a thumbs-up. Like Pratchett has ever earned any less from me. Heck, I just have a lot of fun with his books! Yup, I'm still off hiking, and running out of preface posts. I've just a couple left, so please be patient, and I'll be back to my three times a week publishing schedule as soon as possible! If I'm lucky, I'll get another story out of our next backcountry venture, and will find another nice library to let me post it. No Life for a Ladyby Agnes Morley Cleaveland. Memoir. Publisher: University of Nebraska Press, 1977. Original: Houghton Mifflin, 1941, "Life in America" series. Source: I purchased this in a national park bookstore (can't remember which one now. Those park bookstores are totally our downfall!). Brief description: Agnes Morley was born in Cimarron, New Mexico in 1874, and lived out her life until adulthood (and a fair bit of it after) in some of the wilder parts of that state. Her father was a civil engineer who "built" the Santa Fe railroad, before he was killed by an "unloaded gun" when Agnes was about 7. Thus began a new period in her life, even farther out in the sticks. Her mother remarried, to a man who persuaded her to sink all her savings in a ranch. The man eventually left, but the family owned the ranch until the 1930s. 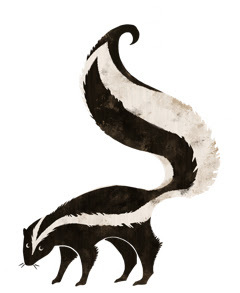 Agnes grew up with a curious mixture of inevitable wildness--and was a pretty good cowboy--and her mother's attempts to civilize her, which eventually led to boarding school back East. The book not only recounts that growing up, but the evolution of the family and the region as both moved from the frontier days to the 20th Century (even if the region was a bit late in arriving at the latter). 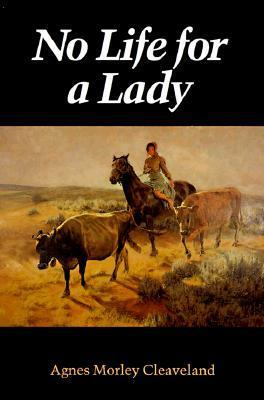 Review: I am constantly on the prowl for first-person accounts of the settlement of the West, especially those of the women and children who so often had no say in the matter (and equally often, as Morley clearly demonstrates, loved it and thrived there--though her mother did not). Such accounts are not usually literary gems, and I would have to say that, though No Life for a Lady is better written than many such "reminiscences" it does nonetheless have it's flaws. Primarily, I could have wished for a stronger sense of chronology and narrative. In effect, after the first chapters (clearly constructed along more typical "biography" lines as the author had to get the information largely second-hand), the book becomes a collection of brief nuggets, loosely connected in a generally chronological manner. I am left with a certain amount of confusion about dates (which she hardly ever mentions) and order of events. On the plus side, those nuggets are real gems that capture with a minimum of words the reality and feel of life in Datil, NM. Cowboys come to life, as do horses and cattle, good and bad. If attitudes toward Indians and Mexicans are the product of her times (and they are), they are nonetheless well-drawn and completely lacking in the hatred and disdain many of her era expressed. I have been reading away at bits of this book since last October, but the slow progress is not an indictment of the writing. Rather, it sprang from the vastness of my pile of library books and the manner in which this narrative lends itself to sampling and nibbling. With no strong narrative, I didn't feel that I lost the narrative thread by leaving it for days and weeks between chapters. I simply enjoyed each chapter for the glimpse it gave me into a life and a period that fascinates me. Recommended: yes, for those with an interest in frontier life. Full Disclosure: I purchased this copy of No Life for a Lady myself and received nothing whatsoever from the author or publisher in exchange for my honest review. The opinions expressed in this review are my own and no one else's. The vacation is going great, having much fun and very little Internet (today for about 45 min, the first in two weeks!